In our media-drenched culture, stage spectacles and movies are sometimes more relatable than real life. R.W. Martin of Starksboro certainly feels that way. “I want to be stuck in that stage world — “Somewhere Over the Rainbow,” he says, breaking into song. While he’s no household name, the long-time performer has experience under his belt. Vermont studios, Stoneworks Entertainment (now Champlain Pictures), and the semi-extant Zen and Chaos Studios have provided small-time opportunities, from lead roles to work as an extra. Martin has also made his way into wide release. He was an extra in the Vermont-shot film The Spitfire Grill and appeared on “Rescue 911.” That dead Romulan on “Star Trek: The New Voyages”? R.W. (Randy William) again. Martin’s maniacal dedication to his craft has led him at times to go 40 hours without sleep several times a week, while simultaneously working his regular job and filming a role. Martin isn’t sure how Holy Headshot’s authors tracked him down. It could have been one of his several YouTube channels, or one of the many websites where he has posted his headshot for free. They may even have found Martin’s own website, recently vanished with the demise of AOL Hometown. 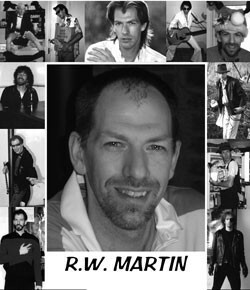 But it’s pretty clear what it was about Martin’s headshot that Borelli, a comedy writer, and Gorenstein, a photographer, found unique. An actor’s headshot is generally just that: a full-face, pensive-looking close-up of the job hunter. To display versatility, the performer may also have a card bearing a few different looks: sporty, elegant, tough — anything he might be able to play. Martin took this concept further. The actor’s 8-by-10 squeezes in not one, not three, but 12 different photos — a headshot in the center surrounded by images from various scenes. He didn’t want to get passed over for roles based on his natural look, which is gangly, long-nosed and slightly goofy — but, on the whole, normal. “They always say, ‘You’re not the right type,’ or ‘We just don’t envision you for this role.’ You need to look past that — put a wig on me!” Martin exclaims. So he put more than a few wigs on himself. Posing at home with his own costumes, backdrops and a camera with a timer, he photographed himself as Ace Ventura, The Riddler, Elvis and Snake Plissken from Escape from New York, to name a few. On the book’s website, some actors featured in Holy Headshot have reported positive fallout from their appearance there, but Martin’s hopes of discovery have not materialized since the book’s October 28 release. “Not for lack of trying,” he notes. When not working nights at Lowe’s and helping to raise his two young daughters, Martin continues to chase his Hollywood dream. Holy Headshot! A Celebration of America’s Undiscovered Talent by Patrick Borelli and Douglas Gorenstein. Simon & Schuster, 240 pages. $18.95.